This item is expected to ship 4-6 weeks after the event on May 21, 2019. If our clients could have thought their way out of the impact of trauma, they would have done that a long time ago. Trauma resolution is not about thinking. Healing depends, instead, on the work undertaken at the level of the autonomic nervous system, which shapes our clients’ experiences of safety and influences their capacity for connection. Traumatic events have a far-reaching impact on this system. Autonomic pathways trigger survival responses that often lead our clients on a painful journey into a state of shutdown, collapse, and dissociation. How can we help our clients find their way back to safety, and how do we prevent it from happening in the first place? 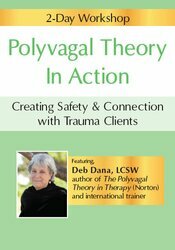 Polyvagal Theory, developed by Stephen Porges, offers a revolutionary roadmap to lead clients out of their adaptive survival responses into the autonomically regulated state of safety that is necessary for successful trauma treatment. Dr. Porges’ colleague and author of The Polyvagal Theory in Therapy, Deb Dana, shares this roadmap with you in this exciting recording. You will become fluent in the language of Polyvagal Theory and confident in your ability to help clients safely tune into and reshape their nervous systems, and rewrite the trauma stories that are carried in their autonomic pathways. Come learn the organizing principles of Polyvagal Theory and work with practices designed to help clients move out of despair and isolation and return to a place of awareness, connection, and social engagement. Describe the principles of Polyvagal Theory and how to communicate them in client friendly language. Explore three circuits of the autonomic nervous system for the purpose of client psychoeducation. Analyze how the autonomic nervous system operates as an internal surveillance system and its impact on clients’ habitual responses to trauma. Determine how to help clients engage the regulating capacities of the autonomic nervous system in order to create an environment of safety. Explain how to exercise the Social Engagement System to assist clients in becoming more adept in skills of co-regulation and creating reciprocal relationships. Assess for patterns in clients’ autonomic states to better inform treatment planning. Summarize the trauma-informed therapist’s role as co-regulator and its impact on clinical outcomes. Identify portals of intervention in the autonomic nervous system to more effectively establish safety and treat trauma. Discover the right degree of neural challenge and exercises to employ with clients to help shape the autonomic nervous system toward safety and connection. Examine how to work with the cycle or reciprocity-rupture-repair in helping clients achieve the biological need for connection. Design a Polyvagal-informed clinical practice based on appropriate assessment and treatment planning. What happens when parts of the system are unavailable? DEB DANA, LCSW, specializes in treating complex traumatic stress and lectures internationally on the ways Polyvagal Theory informs clinical interactions with trauma survivors. She is the coordinator of the traumatic stress research consortium in the Kinsey Institute at Indiana University and the developer of the Rhythm of Regulation clinical training series. Deb is the author of The Polyvagal Theory in Therapy (Norton, 2018) and co-editor with Stephen Porges, of Clinical Applications of the Polyvagal Theory (Norton, 2018). Deb received her B.A. in social welfare and her M.S.W., both from the University of Southern Maine. She is trained in Internal Family Systems, Tapas Acupressure Technique, and Sensorimotor Psychotherapy. She completed the certificate program in traumatic stress studies at the Trauma Center. Non-financial: Deb Dana has no relevant non-financial relationship.